Posted by bart333c on Wed, 10/07/2009 - 15:43. Posted by jj on Thu, 02/03/2005 - 01:02. Gilmour settings for different equipment? Posted by Chris on Wed, 12/29/2004 - 16:23. So for Christmas, I recieved the Boss BF-3 flanger, PH-3 phaser, and DD-3 delay. I'm attempting to recreate that Gilmour sound found on Breathe and Us & Them. Any recommendations as to settings within the pedals? For the flanger you can adjust the depth, rate, mode can be either ultra standard or gate/pan, and also there is an adjustment saying "res" and "manual". For the phaser you can adjust the rate, depth, res, and set for step, rise, fall, 12, 10,8, and 4 for the stage. Lastly, the delay can adjust the e.level, feedback level, delay time, and also under mode there us 50ms, 200ms, 800ms, and hold. Any recommendations at all? Greatly appreciate it. Posted by Carlo on Sun, 10/03/2004 - 05:55. Hi, vorrei avere info circa la strumentazione di Rick !!! Re: ..and Rick's instruments ?? Posted by victorio on Tue, 12/07/2004 - 00:53.
me piace molto scrivere in italiano, non sai como, perche tuta la mia famiglia solamente parla il portoghese, e cerco per qualcuno italiano che vogliat sentire a me. se ha alcuna dobta, pregunta-me. : Hi, vorrei avere info circa la strumentazione di Rick !!! Posted by Filmour on Fri, 09/17/2004 - 09:16. I'd like to create a second pedalboard based on boss effects. I have some boss gilmoresque pedals (hm2, mz2, flanger and chorus...) and I would like to known what kind of pedals where in the SCC700 pedalboard used by gilmour during about face tour and for the recording in the studio. Posted by daniele on Fri, 09/10/2004 - 09:02. I tried to reproduce it by using my boss bf-2 but I ear a very strong sweep effect. Does the filter matrix of the mistress eliminate this effect and help to achieve the tipical gilmour sound?Thanx!!! Posted by Tigrar on Fri, 10/28/2005 - 15:32.
: I tried to reproduce it by using my boss bf-2 but I ear a very strong sweep effect. 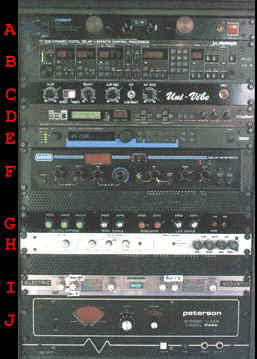 : Does the filter matrix of the mistress eliminate this effect and help to achieve the tipical gilmour sound?Thanx!!! Posted by Filmour on Fri, 09/17/2004 - 09:21. The electric mistress is what you need for the gilmour sound. Posted by daniele on Thu, 09/23/2004 - 06:03. Dave's distorsions are never "noisy", the sound is never fuzzy, dirt, he achieves the same CREAMY sound with any kind of stomp box(rat, muff,...),from 70s to 90s. I can recognize that sound in any album. When I turn on the Muff the sound is very dirt,orrible also with low amount of distorsion. How can you explain it? Does the soft sustain do this? Posted by nico on Mon, 10/11/2004 - 06:44.
: Ok, I have another question for you. : Dave's distorsions are never "noisy", the sound is never fuzzy, dirt, he achieves the same CREAMY sound with any kind of stomp box(rat, muff,...),from 70s to 90s. : I can recognize that sound in any album. : When I turn on the Muff the sound is very dirt,orrible also with low amount of distorsion. : How can you explain it? Does the soft sustain do this? Gilmour uses muff and rat, boosted with a GE7 pedal, for heavy distortions. Posted by filmour on Tue, 10/05/2004 - 05:42. Firs of all I agree with Riis (www.gilmourish.com): the gilmour sound is in his fingers. He can use the muff, hm-2, rat, tube driver ecc but he achieves the magical tone. In general remember that you have to put the volume at 10. For the lead parts gilmour plays with a lot of feedback (listen to the old bootlegs...) and that helps to achieve a CREAMY sound. Besides he uses clean amps (hiwatt and fender) so he can have a strong distortion (I say a "clean distorted sound"). For the muff and for your distortion in general, try to set the tone at 9:00 o'clock and to use a pedal equalizer for boosting bass. Rememeber gilmour use a bass preamp (alembic) and boss ge-7. Posted by daniele on Fri, 09/10/2004 - 09:01. Posted by David Waters on Thu, 07/21/2005 - 13:31. To get the perfect Gilmour sound, without alot of other pedals. Go Boss Dig.Metalizer. Trust me I have Fuzz Face (darkside) and Big muff (Wall) But the boss metalizer is my favorate and don't get to fuzzy! Posted by puig bruno on Fri, 12/05/2003 - 20:31. Hello! Does this site still work? Posted by riis on Mon, 05/03/2004 - 10:46. Re: Hello! Does this site still work? Posted by daniele on Thu, 09/16/2004 - 08:54. I think it doesn't any more! Posted by dan on Fri, 08/13/2004 - 02:33. Posted by Cynthia Gathers on Fri, 05/09/2003 - 19:29. Distortion solos in "Delicate sound of thunder"
Posted by Daniele on Fri, 07/18/2003 - 08:35. Can anybody help me, please?Thanks. Re: Distortion solos in "Delicate sound of thunder"
Posted by filmour on Thu, 07/24/2003 - 11:37.
: the Chandler tube driver. : Can anybody help me, please?Thanks. What you hear is the big muff. During the delicate sound tour gilmour didn't use the chandler. Posted by Barao on Tue, 03/22/2005 - 15:52. Momentary tour, Gilmour use a Ibanez Tube Screamer!!! Division Bell Tour, he used a Chandler Tube Drive!!! : : the Chandler tube driver. : : Can anybody help me, please?Thanks. : What you hear is the big muff. : During the delicate sound tour gilmour didn't use the chandler. Re: chorus or mistress in delicate sound of thunder? Posted by daniele on Wed, 07/30/2003 - 18:17. In this concert gilmour is still using the electro harmonicx Mistress or a chorus?thanks. Posted by filmour on Sun, 08/31/2003 - 06:34.
: In this concert gilmour is still using the electro harmonicx Mistress or a chorus?thanks. Posted by chris on Tue, 03/04/2003 - 19:16.
wanted guitar tabs/scores for floyds echos from meddle please. Posted by jack on Mon, 08/05/2002 - 09:13.
Who has the division bell songbook ? anyone have a Cornish Soft-Sustain? Posted by Ian on Fri, 01/24/2003 - 15:38. I'm considering this pedal because I've read really great reviews on it, has anyone here tried one? Re: anyone have a Cornish Soft-Sustain? Posted by Ralph on Thu, 05/22/2003 - 00:27.
: I'm considering this pedal because I've read really great reviews on it, has anyone here tried one? I have a P-2 Precision Fuzz and only 1 word describes it AWESOME! So incredibly dymanic and sensitive to touch. I loved it so much that I ordered a Soft Sustain . I sold all my dirt to get these my RAT , Big Muff, Chandler Tube Driver and most of my other pedals but in the end it's more than worth it. They are really pricy but they are truly a professional sound . I highly recommed these pedals not only to Gilmour fans but also to those looking for true tone. You really don't need all the gear listed above to achieve a tone similar to Gilmour, alittle reverb, delay, Boss Ce-2 and Cornish pedals and you are there. Posted by catfamily on Sat, 11/29/2003 - 01:46.
: : I'm considering this pedal because I've read really great reviews on it, has anyone here tried one? : I have a P-2 Precision Fuzz and only 1 word describes it AWESOME! So incredibly dymanic and sensitive to touch. I loved it so much that I ordered a Soft Sustain . I sold all my dirt to get these my RAT , Big Muff, Chandler Tube Driver and most of my other pedals but in the end it's more than worth it. They are really pricy but they are truly a professional sound . I highly recommed these pedals not only to Gilmour fans but also to those looking for true tone. You really don't need all the gear listed above to achieve a tone similar to Gilmour, alittle reverb, delay, Boss Ce-2 and Cornish pedals and you are there. Contact the Amp Shop on Ventura Boulevard in the Los Angeles area, probably Studio City. They only carry the best equipment and have some Cornish pedals. Posted by Dan Punch on Tue, 01/28/2003 - 04:13. I am curious to know how David achieves that grinding gritty distortion for his solo on Time. Any suggestions? Re: Distortion sound on "TIME"
Posted by Mainge Rover on Fri, 11/05/2004 - 16:34.
: I am curious to know how David achieves that grinding gritty distortion for his solo on Time. Any suggestions? I was told that it's the result of a Dallas-Arbiter Fuzz Face. I bought one the reissues from Dunlop, sent it straight into the clean channel on my Carvin Legacy head, and viola, Time. What's particularily cool about the Fuzz Face is the way it kind of bottoms out (clips and compresses?) when you hit bassy chords, such as the F#m that finishes off the Time solo. Give it a try. Posted by Neal on Mon, 04/26/2004 - 19:49. I play that song sometimes with my band...awesome song. I use a 1972 Fender Telecaster Custom (humbucker) and I use a Japanese Boss super OD (with gain just under half way) I also use the Boss DD3 (delay) not sure what the settings are, but you just have to figure it out til it sounds right. I play out of a 1978 Fender Twin Reverb, so I get a really warm tone, oh yeah and I use 10 gauge strings. Hope this helps. Posted by pat on Tue, 01/28/2003 - 09:49. Posted by Floyd on Wed, 01/15/2003 - 00:37. Sorry for the no responses lately-but pretty busy. I'd like to hear any ideas or things you'd like to hear about it in the next article. : Who has the division bell songbook ? Posted by riis on Wed, 01/29/2003 - 07:44. I have never really studied Gilmour's work with other artists. It would be interesting to get a list of wich guitars he used on different gust appearances and collaborations. One that I really love is his solos and sound on No more lonely nights with McCartney on his Broadstreet album. Posted by squanto on Wed, 04/30/2003 - 21:04. Posted by Floyd on Thu, 11/28/2002 - 02:48. Posted by Riis on Sun, 12/15/2002 - 16:00. Again, thanks for a great article! Playing in a Norwegian tribute band myself ,I have never really studied the sound Gilmour has on the albums. I know all the solos ofcourse, but for the equipement and sound I tend to use the old bootleggs. Nice to have an article that clearify the studio Gilmour. Still I would like to comment on a couple of things; and this is just my opinions. What I, and my fellow bandmembers, have always had as a motto is that album Floyd and live Floyd is more or less two completely different bands. I have heard a couple of Floyd tribute bands that nails the albums to the tiniest detail, but it still sounds dull and uninspired. And if you listen to boots from the 70ies Floyd are more aggressive and rough sounding than any studio recording. The same goes for Dave's guitar. On pretty much all the albums, his sound is rather dry and clean and he's much more delicate in his playing. You can hear his blues influences. Have you ever tried to compare Animals the record and a boot from the 77 tour? I love Dave's crisp, earpinching sounds on the record, but live you can hear him stomping on every box he ever had and his plaiyng is so aggressive at times that I can only imagine him playing out his rage towards Waters. I think this is very important. And for all of you Gilmour clones; trying to do the intro solo on Shine On with the same sound on the record doesn't do it live. You'll drown on stage. Listening to the very first attempts the band made in late 74 and trough 75, Dave used a very dry amp overdrive for nearly all of the new material (WYWH) He used some delay and for most of Shine On he used the MXR Phase 90. When they toured with WYWH for the first time in 77 Dave has a more sloppy sond to his guitar. I think this is the first time when he really uses compression to colour his sound. For the Shine On intro and second solo he use lots of compression and the EH mistress. When they indtroduced WYWH songs in 74-75 Dave used a modified Tele (w/DiMarzio picups) and sometimes a Fat-Tele (a humbucker for the neck pick up). He continued to use Fender Telecasters for the 77 performances of Shine On 1-5. On the record it sounds like a Strat, but with the Tele he got that crisp tone and a sloppy bottom. A perfect match with lots of compression.For the slightly overdriven sound I believe he just crancs his amps. My set up for this 77 live version is; Fender Tele, MXR Dynacomp (V 13:00/ S 13:30) and HM Mistress (R 22:00/ C 23:00/ Range off). For the third solo I'm pretty sure he use the EH Big Muff (V 80% / T 20 % / S 100%). Dave's using alot of reverb. Delay wise he tends to stick with one rate (different from tour to tour in the early days) and ajusting the feedback form song to song. I don't know what settings he used on the WYWH album, but listening carefully to the boots I discovered that he use a slightly faster delay than I can remember him using on the albums, try 370ms and a rather long feedback (mostly used on Syd's theme). For the distortion units I don't believe he started to use the Muff until the In the Flesh tour of 77. Remember that the Muff is a sustain pedal and not a fuzz. The Big Muff has a very smooth sound, but trying to obtain a warm overdrive is nearly impossible. The Fuzz Face however is much more versatile. But listening to the third solo on Shine On and the solo for Cigar I belive he is using a amp type distortion. Comparing this with the live versions he used just a mild overdrive in 74-75 but in 77 you can clearly hear the Muff with lots of compression and a crisp tone for the third Shine On solo. What I find most interesting in with this new article is the discussion on what kind of pick Dave's using. I have always tried to underline the importance of using the right tecnique. It doesn't matter how many pedals you got or how fancy and modified your guitar is, if you don't use your fingers right. What I've learned is that Dave is always holding a tone close to the frets almost on the metal. This toghether with a heavy pic, you'll get that crisp clicking sound. I also notised that he tend to hit the strings harder when he's playing with an overdrive. This adds a more dynamic style and is great for solos as Wall part 2, Coming Back to Life and Shine On (2. solo). The best example of technique is Dave's solo on Coming Back to Life on the new DVD. He plays with an acoustic guitar and it stills sounds like a Strat! That's because of his technique, the right use of his fingers.... and of course because his Guilmour. OK this became a little longer than I expected. Shine On and Merry Floydmas! Posted by Floyd on Tue, 12/17/2002 - 22:37. I'd like to post this if you don't mind? You brought up several great points. First his live sound and studio sound are two different things, and people who follow the equipment charts often get mislead, this is all his live gear, in the studio he is much more experimental, but often uses some of the same gear. As in the Shine On solo's I too have fumbled playing, because too much reverb, delay, and general ambience by the guitar makes it clutter, and screw the sound. I also find I had to be too gentle, and closed with my playing, to make sure everything was right. I also collect bootlegs, although I prefer 70-72. I have a few from WYWH and Animals, I really never found one I liked till I think 07/18/77 came to me in the mail, where I finally heard great versions of the songs. I often would think Gilmour himself was trying to play studio like, but after that and stellar symphony (another roio) I noticed a trend. He began relying less on effects, and more playing while live, and was alittle more free. I'd agree with you on the effects and all that as well, you ever notice the intro to dogs, he is using a mistress? I'm don't think I said he used a Muff in Shine On, but rather and overdrive, or treble and bass boost. It could have been a fuzz with the fuzz down as well. I noticed, that when he hit tours in 77 have a cigar was much more distorted, I liked it alot. As well as Shine on, which began overdriven. I firmly believe Gilmour is one of the top improv players of the century. I get a bit tired of the pick arguement, but agree in a heavy one, lightly picken. I researched for hours upon hours to figure out where he plays with his fingers (closest to the next fret as possable) it also creates a slightly sharper tone. And finally you nailed it, his tone is in his fingers, there is no doubt about it. From his vibrato, to finger location, to picking motions...no one can simulate him perfectly, but we'll always try. Of course I like adding my own bits in too. Posted by paul on Tue, 12/17/2002 - 09:35. Why don´t you write it to the Floydianatom BBS. Whats wrong with it... nobodys using it. Posted by filmour on Tue, 12/03/2002 - 11:04. I have seen the picture about dave's rack, and i've noticed that the three knobs of the mistress are (from left to right): 11, 1, 1 o'clock. So i remember your mistress set up is rate 12, range and color 11 o'clock, and if i've to replicate the wall live sound i've to increase range and color at 1.
it's so olso for you? And what about Gilmour setting? Why I don't hear that trublesome sound but only the chorusly depth? Posted by Floyd on Tue, 12/03/2002 - 20:22. Well after trying it, I'll be damned, it does sound more like the Wall sound. I stand corrected, thanks from bringing that up. Can you confirm he has an original mistress rather than the deluxe? I'm not sure really what the question was, although it sounds much more right with my mistress to use the settings you just said. However, I think in live performances such as the ITAOT, and Wall Live bootlegs he uses the settings abit higher to give it a more pronounced tone. : I have seen the picture about dave's rack, and i've noticed that the three knobs of the mistress are (from left to right): 11, 1, 1 o'clock. : So i remember your mistress set up is rate 12, range and color 11 o'clock, and if i've to replicate the wall live sound i've to increase range and color at 1.
: it's so olso for you? : And what about Gilmour setting? Why I don't hear that trublesome sound but only the chorusly depth? Posted by tim on Tue, 12/03/2002 - 03:15. Posted by paul on Mon, 11/25/2002 - 07:13. Posted by Floyd on Thu, 11/28/2002 - 01:31. Hmm, well-I guess I could work on it this weekend...expect it within a few days. Comfortably Numb sound on a PXR4? Anyone? Posted by Gorham Miscall on Sun, 11/24/2002 - 16:47. Does anyone have any experiece with the Korg PXR4? I would like to get as close as possible to the final solo sound on Comfortably Numb (Pulse Version) and the intro solo to Coming Back To Life (Division Bell). I realize that Gilmour's equipment is extensive, but if someone has already figured out the setting for the PXR4, I would really appreciate them. Posted by Ilan on Fri, 11/22/2002 - 04:00. Did Dave use the electric mistress when he played Comfortably Numb on Pulse? anyone knows which effects he used there? Posted by Leo on Fri, 11/22/2002 - 05:08. Personally, I don't hear the Electric Mistress effect on Comf Numb on Pulse. EM is not a subtle effect - if it was there, I'm sure we'd hear it obviously...like in the Wall Live. I'm not a big fan of the EM anyway, since I think it really takes away the warmth, depth and thickness of my sound. : Did Dave use the electric mistress when he played Comfortably Numb on Pulse? anyone knows which effects he used there? Posted by Floyd on Fri, 11/22/2002 - 20:18. Well I don't think he used it on pulse, it sounds much more like the Pete Cornish P-2 Fuzz, perhaps a mix of some of his other distortions in there as well, as he didn't use reverb on it because the stadium would create enough. Posted by Floyd on Fri, 11/22/2002 - 02:52.